In addition to Patrick Coman on vocals and rhythm guitar, plus Peter Parcek on lead guitar and Marco Giovino on drums, percussion and organ, the talented group of players assembled for the recording sessions included Joe Klompus (Letters to Cleo) - upright and electric bass; Neal Pawley - tuba, trombone, lap steel, baritone guitar, guitar and electric mandolin; “Beehive Queen” Christine Ohlman - vocals (who lends her unmistakable grit to the spirited duet, “Don’t Reach”); Kylie Harris and Abbie Barrett - background vocals; and Tom West (Peter Wolf, Susan Tedeschi) – keys, organ and accordion. A long-time Boston musician and radio personality before recently locating to Charlottesville, Virginia, Coman was very familiar with both Peter Parcek and Marco Giovino. “Getting to play with Peter over the past few years has been like going to school,” states Coman. “From him I’ve learned so much about playing the blues, but perhaps more importantly I’ve learned what it means to be a working musician and a bandleader and to create music with power, substance and integrity. Nearly all of the material on the new CD was written in the months leading up to and directly following the birth of Coman’s first child. With a new baby in the house, songs were pieced together late at night or early in the morning in that mystical twilight period where dreams and reality blur. This cosmic bridge is reflected in the album’s title and sequence, where haunting opener “Heartbeat” beckons the listener into this eerie dreamlike landscape, before galloping across a fun house mirror version of Americana that reflects back in ways that seem both familiar and strange. 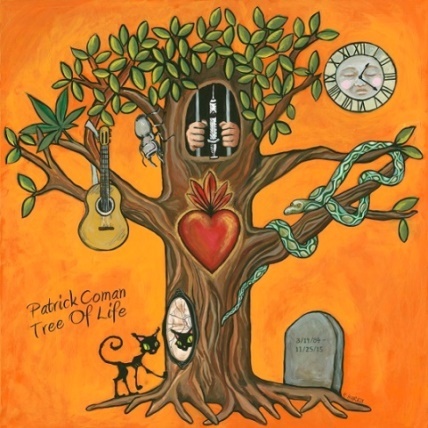 It’s clear that Patrick Coman’s Tree of Life has many musical branches. In an era where volume dictates attention, Patrick Coman pulls his audience in with a quiet, unshakable confidence. It’s a confidence built from a decade behind the scenes with some of the generation’s best songwriters as a booking agent, sound engineer, and DJ/producer for premier Americana station WUMB-FM in Boston, before stepping into the spotlight with his debut full- length album, Tree of Life. Turning his back on a career in the music business to spend his time as a stay-at-home father by day and full-time musician by night has paid dividends for Coman as a writer and performer. Over the past year he’s opened for a crop of revered Americana artists like Del McCoury, Robbie Fulks, Larry Campbell & Teresa Williams, Joan Osborne and John Fullbright, while veteran musicians like Parcek and Giovino have taken him under their wing. Coman’s own vocals bear the laidback blues-inflected style of fellow Tulsa, Oklahoma, natives JJ Cale and Leon Russell, while the protagonists in “The Judge” and “Trouble #2” bring to mind Woody Guthrie. The album also stirs in touches of Lou Reed’s street walkin’ strut, the swampy groove of Little Feat, and darkly humorous rockabilly rave ups that swing like demented versions of Sun Studio classics.